Dining out is a pleasure that we all like to indulge in from time to time. Before you dive into your meal though, you should know that there is plenty on the menu that can put you at a higher risk for obesity. The prevalence of obesity in the United States alone is close to 35 percent. Obesity leads to a long list of chronic health problems and costs our health system millions of dollars. It can be too easy to point to delicious sounding items on a menu without thinking about the high calories, high sodium, and high level of saturated fat in them. 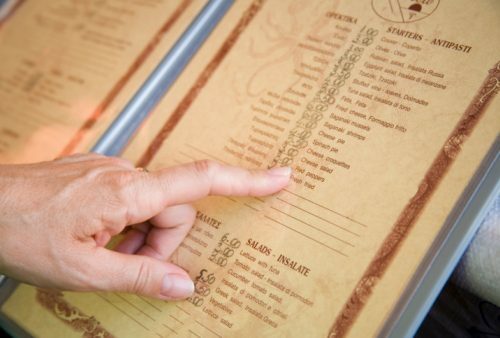 Whether you are counting calories or not, there are some restaurant foods that you might want to avoid. Nutritionists say this is because they either have little nutritional value or they have more calories in them then what you are supposed to consume in a single day. The Centre for Science in the Public Interest looks at restaurant menus on an annual basis and they’ve compiled a long list of some of the worst restaurant foods you can consume when it comes to obesity. Have you ever had a fried cheese melt dish? It’s popular among cheese lovers. It’s a grilled cheese sandwich with American cheese, four fried mozzarella sticks and a side order of fries. The French fries normally come with marinara sauce. This dish has about 1,300 calories and 3,000 mg of sodium. A global favourite, the bacon cheeseburger is also considered one of the worst foods on any menu. The high fat content alone puts it in this category. Bacon and eggs, which are often cooked in thick grease and deep fried chicken wings, are also considered high in saturated fat. Here are a few other restaurant items you might want to think twice about ordering if you are concerned about risk of obesity. Of course it isn’t just the main dishes that we look at when we are counting calories and trying to avoid obesity. Red velvet cheesecake sounds inviting, but the Centre for Science in the Public Interest reports that it has about 36 grams of saturated fat, 4,670 mg of sodium, and 1,990 calories. According to the Mayo Clinic the average American shouldn’t consume more than 2,000 calories in a day. A big draw for both locals and American tourists is stuffed hotcakes. They are particularly inviting during cold winter months. Hotcakes are pancakes with chocolate or cinnamon chips, cream cheese, cream sauce and whipped cream. They have approximately 34 grams of fat and 1, 380 calories. It can be hard to say no to all those seemingly delicious items staring back at you from the menu, but all of the warnings about obesity don’t mean that you can’t enjoy some of your favourite treats. For instance, dieticians say instead of never enjoying those burgers you love so much, try a child’s meal or a junior burger. If you like pizza, order a thin crust version or have 2 pieces and take the rest home for another meal. As for dessert, you don’t have to give it up all together. Many restaurants now offer fresh fruit and other low fat desserts for those who are counting calories or are just being health conscious. Another positive note…Pennsylvania State did a study on restaurants and discovered that chefs and restaurant owners felt that they could continue making a lot of the dishes that customers have grown to love, but trim off a significant amount of calories without compromising taste. The authors of the study say changes like this could take a huge bite out of the obesity epidemic in the United States.